Chipotle Mexican Grill (CMG) Wednesday delivered fourth-quarter earnings of $1.72 per share, which came in well above analysts’ projection of $1.37 per share. 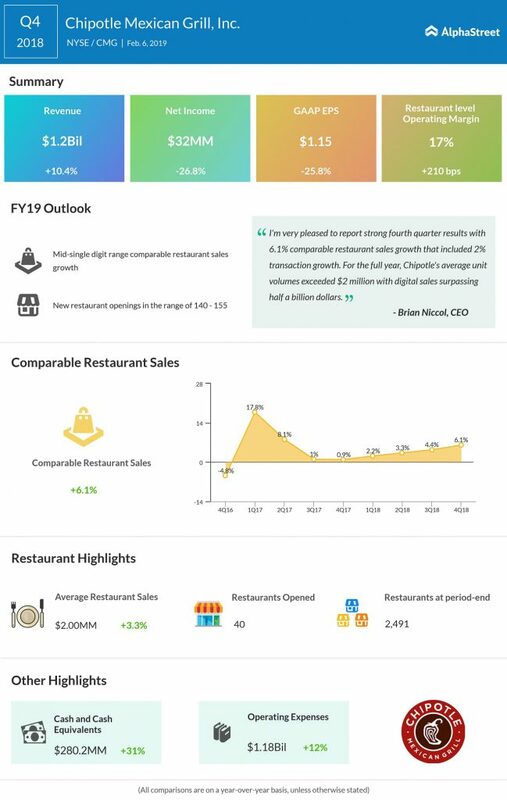 Revenues gained 10.4% to $1.22 billion, surpassing the street consensus of $1.19 billion, driven by a 6.1% increase in comparable restaurant sales and new restaurant openings. The increase in comp sales was primarily due to an increase in average check as well as a 2% increase in comparable restaurant transactions. CMG stock popped over 7.5% during after-market trading on Wednesday. In Q4, digital sales jumped 65.6%, accounting for about 13% of overall sales. 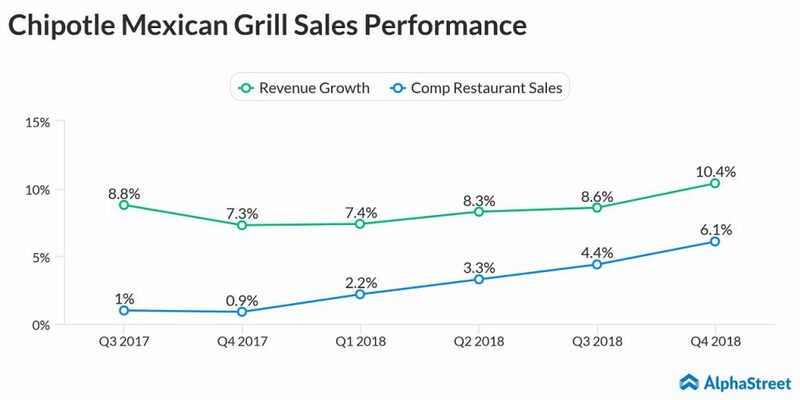 For 2019, the Newport Beach, California-based restaurant chain expects comparable restaurant sales growth in the mid-single digit range. The company also expects to open 140 to 155 new restaurants during this period. In the fourth quarter, Chipotle opened 40 new restaurants and closed or relocated 12. Despite being marred by repeated food poisoning incidents, CMG stock had a great run in 2018. In the past 52 weeks, Chipotle has gained 78%, with the stock hitting a three-month-high last week. However, this is still a far cry from Chipotle’s 2015-high of $749.12. The restaurant store chain has been rejigging its menu to include healthier options for diet-conscious customers. The company, which is often criticized for providing only high-calorie food items, hopes this kind of menu expansion would help bring in more customers, and in turn, improve the lackluster traffic numbers.